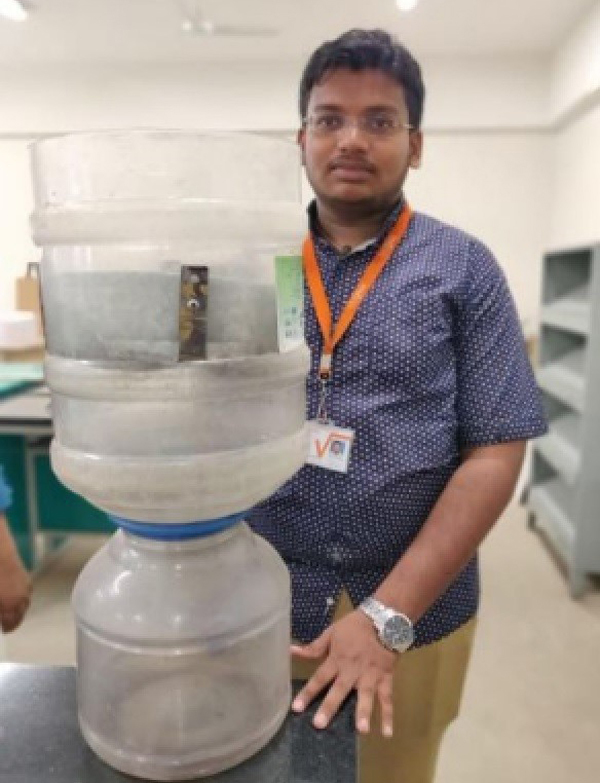 Bengaluru, 20 Jul 2018: MVJ College of Engineering students discovered fruit peels filter to clean contaminated lake water. The experiment was done by using Bellandur Lake water-one of the most polluted water body in the city and the results were successful. Evaluation of Usage of protonated or activated biotic layers’/semi-permeable membrane (especially fruit peels) to reduce the toxic froth in the lakes caused due to effluents containing halides namely fluorides. The causes for the pollution is the presence of fluorides, nitrates and some ruminant effluents of phosphorous which is been released through the untreated sewage water from the industries surrounding the water bodies. Of these fluorides plays the major role in creating the froth. These lakes carry these effluents with them as soon as they pass from the higher to lower gradient or pass through the ducts and flow in between, the froth gets generated. These froth due its low weight and density stays above the water body and floats like an iceberg on the water. Most of the industries present around the water bodies are of industrial dyes manufacturers, industrial fabricators, lubricants, and oils. These industries use halides especially fluorides and some volatile compounds during the manufacturing stage and release the ruminant effluents through the sewage to these water bodies which later cause frothiness in the lake and the presence some volatile compounds in them cause the fire on forth. An activated semi-permeable biotic membrane made of acidified watermelon, banana, pineapple and citrus peels is a low-cost alternative for removing the frothing agents in lake. The adsorbent is activated using acid which makes the process spontaneous and exothermic. The peels of watermelon, lime, pineapple, and banana are treated with mild acid approximately .1 N to increase their efficiency and making them cation major surfactant so that they absorb the anions present in the water at a faster and countable rate. These peels are placed one above the other in the filter separated at a small distance between each other such that the water flows through the peels without getting stagnant. Contaminated water or the effluent is passed through the filter from a higher gradient which removes all the solutes. The filter can approximately purify 5 to 6 liters of polluted frothy water by using about 150-200 grams of biotic layer. Watermelon peels have the presence of potassium, magnesium and other major cations (high electropositive element) in them. These cations help in the removal of halides and fluorides which are major electronegative elements. The banana peels help in the removal of other industrial effluents such as lead, copper, cadmium, and zinc which also constitute the industrial water pollutants. The pineapple peels are also acidic in nature as citrus fruits they help in the removal of halides.